A telescopic scleral lens unveiled at the annual American Association for the Advancement of Science meeting could one day replace more cumbersome bioptic telescopes mounted through spectacle lenses to improve the vision of patients suffering from age-related macular degeneration (AMD). The telescopic scleral incorporates a concentric pattern of circular reflectors that act as mirrors to enlarge objects to 2.8 times their actual size. A pair of modified 3D television glasses block either the magnifying portion of the scleral contact lens or its unmagnified center by electrically changing the orientation of polarized light. Infectious keratitis is more common in patients who live in suburban areas and during non-winter months, according to a four-year study of keratitis patients in eastern Pennsylvania published in the March 2015 Cornea. Pseudomonas aeruginosa was found to be the most common bacteria and Fusarium the most common fungus in contact lens-related cases, while Staphylococcus aureus was identified as the most common bacteria and Candida the most common fungus in non-contact lens-related cases. Oral omega-3 fatty acids (O3FA) may have a positive impact on epithelial cell morphology and goblet cell density in contact lens-related dry eye, reports a study published in Cornea. Dry eye syndrome has previously been linked to O3FA deficiency. Corneal crosslinking (CXL) does not affect scleral lens tolerance in patients with progressive keratoconus, according to a small prospective study in the March 2015 Optometry and Vision Science. However, lens fit should be reevaluated after CXL, as some fitting parameters can change. Check Out More Articles from the March Issue of RCCL Here! Ocular allergy and dry are two of the most common ocular conditions worldwide, affecting an estimated quarter of the global population. This prevalence makes understanding their respective pathologies, symptoms and treatment options key to building and maintaining a successful practice. 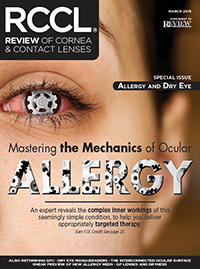 To help, the March issue of Review of Cornea & Contact Lenses is devoted to improving your understanding of ocular allergy and dry eye. Below are 20 great pearls shared by several experts in the field. For more detail, click through to read the original articles for each.